The University of Aberdeen’s mycoBiologics team has made significant progress in developing treatments to help tackle the growing problems of deadly fungal infections and antibiotic resistance, after being awarded £400,000 from Scottish Enterprise’s High Growth Spin-out Programme (HGSP). The team, headed up by Principal Investigator Dr Fiona Rudkin, has been working since 2012 on developing tailor-made antifungal antibodies to treat serious fungal infections – currently responsible for the deaths of 1.5 million people every year. Those most at risk include cancer, ICU, surgical and transplant patients; a growing population as more diseases become treatable and survival rates improve. There are currently no other antifungal drugs of this type approved for clinical use, meaning the mycoBiologics team has a great opportunity to plug a gap in the medicines market. The global anti-fungal drug market is forecast to be worth as much as $13.45bn by 2023. Crucially, the team is also developing antibacterial antibodies as an alternative treatment option to antibiotics, helping to mitigate the growing problem of antibiotic resistance, which has been identified by the World Health Organisation (WHO) as one of the biggest current threats to global health. The team already has interest from several pharmaceutical companies, and the HGSP funding from Scottish Enterprise will help them attract private investment in order to carry out clinical trials with a view to securing lucrative licensing deals. Once this happens, most of the early stage research and development work will be managed and delivered in-house by the mycoBiologics company, creating around 15 high-value jobs by year five. 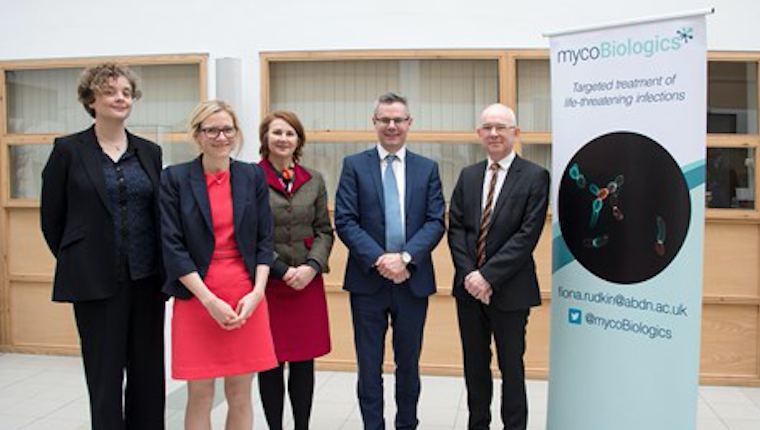 Cabinet Secretary for Finance, Economy and Fair Work, Derek Mackay, visited the MRC Centre for Medical Mycology at the University this morning to meet the team behind the innovative project. He said: “The Life Sciences sector is extremely important to the Scottish economy and in 2017 business R&D expenditure in the sector was £293 million, representing 23.5% of the Scottish total spend. Caroline Strain, Scottish Enterprise’s Regional Head for the North of Scotland, said: “Through HGSP we work with leading academics all over Scotland to help turn their innovative and often life-saving ideas into successful business ventures. The work done by Dr Rudkin and her mycoBiologics team is an excellent example of this, harnessing the research capabilities of the University of Aberdeen to help tackle some of the biggest health concerns facing society today. Dr Fiona Rudkin said: “HGSP funding has been vital in supporting us as we transition from the University of Aberdeen to securing private investment and setting up mycoBiologics as a new biotech company. mycoBiologics will be based in Aberdeen, adding to the growing cluster of biologics-based companies in the region.